Funny how things work out in politics. Earlier this month, the Chicago Tribune covered how President Obama and Governor Pat Quinn moaned about income inequality and the middle class at a speech at Northwestern just minutes after hosting a $50K per person lunch. Voters who pay attention can see right through those shenanigans. 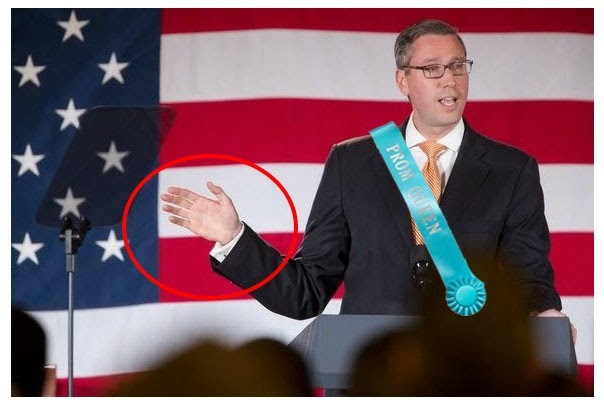 And, now...look at Mike Frerichs - who is running for Illinois Treasurer. He's been crowing about 'growing the Illinois economy from the middle out' and 'banking deserts' and such. But...as for his own tastes? He's quite fancy. He's well known for his love of wearing a sash. And earmuffs. But take a peek at him at yesterday's event in Rockford. Listen...those folks in the 'middle class': he knows your pain. As long as your pain includes having to wait for the dry cleaner to open up in the morning so you can get your french cuff shirts.